Liberals gleefully celebrated Democrats taking undivided control of the White House and Congress in January, ecstatic that Republicans would have less authority than at any time since the 1994 elections. But despite the GOP’s relative irrelevancy, the Democratic enthusiasts at MSNBC seem reluctant to get off the campaign trail, spending far more time targeting Republicans and conservatives than scrutinizing the new bosses inside the Beltway. Exhibit A is “Hypocrisy Watch,” a daily segment on MSNBC’s 6pm ET 1600 Pennsylvania Avenue billed as going after “an organization or person who clearly seems to be doing something that makes the term appropriate.” 1600 was devised as a relatively straight political news show — it was first anchored by David Gregory before he was tapped to host NBC’s Meet the Press, and grew out of last year’s Race for the White House campaign round-up program. 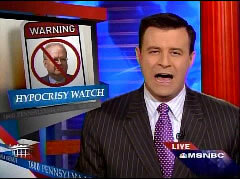 And Gregory’s replacement, David Shuster, was a supposedly objective reporter for NBC Nightly News and Today as recently as 2008. Shuster’s “Hypocrisy Watch” segments are hardly a nonpartisan exercise in speaking truth to power, but rather a lazy regurgitation of Democratic talking points. 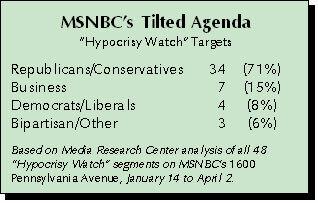 Of the 48 “Hypocrisy Watch” segments since the near-daily feature began January 14, nearly all (86%) blasted Republicans, conservatives and corporations. A mere eight percent — one tenth as few — targeted Democrats or liberals. Two segments went after politicians from both parties, while one condemned the dictator of Zimbabwe, Robert Mugabe. To make Shuster’s list, it helps to be a strong conservative detested by left-wing bloggers. Radio host Rush Limbaugh has made the list twice, as have Governors Bobby Jindal and Sarah Palin, Representative Michele Bachmann, and Senator Jon Kyl, all Republicans. Ex-Bush advisor Karl Rove was named five times, more than all of the Democrats combined. Shuster did target President Obama on January 30 for putting lobbyists into his government after pledging the opposite as a candidate, and again on March 17 and 30 for failing to be tough enough on business, a routine complaint from the left-wing blogosphere. But conservative complaints about the Obama administration — such as dishonestly claiming $1.6 trillion in Iraq war savings over the next decade by using the troop surge as a baseline — were utterly ignored. Starting April 6, 1600 Pennsylvania Avenue is being replaced by left-wing talk host Ed Schultz, but the nakedly partisan Shuster will co-anchor two hours of live coverage each afternoon. With MSNBC’s reporters now just as left-wing as the network’s prime time hosts, why should anyone take this network seriously?